Practice Area: Driving range with grass tees. Putting green. Description: This course is hidden among the farms in Union County. No houses or other civilization to intrude on your round. Just golf. Plays like a mountain course, with an elevated tee or green on almost every hole. The greens were redone in Diamond Zoysia grass in 2013 and are some of the best in the area. Notes: Affordable membership plans are available. 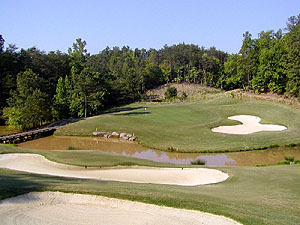 B-Man's Take: This course is a well-kept secret since it is a good 45-60 minute drive from uptown Charlotte. 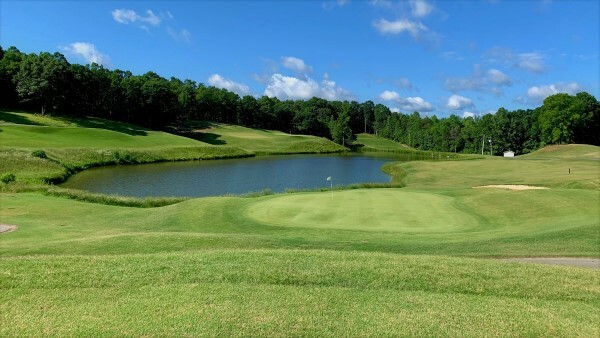 It is a fun course to play with the hills and elevated tees. The zoysia greens are usually immaculate. Water comes into play on the first 3 holes and 7 of 18 overall. My favorite holes are #6 (189yd par 3 with elevated tee and pond on the right) and #13 (332yd par 4 with pond on the right). My definite hell-hole on this course is #2 - a 412yd par 4 with an elevated tee looking down on a narrow fairway with water on both sides. I would pay $5 extra to play here if I could right down par and skip this hole every time. I try to make it out to Eagle Chase a few times a year. It is affordable and kept in great shape. One note of warning, the cart paths here are notoriously bad -- just skip them when you can and drive in the grass.